The Dallas Mavericks mounted another two-pronged ratings attack Tuesday, beating Portland in Game 2 of their playoff series while TNT soundly whipped TXA21's homegrown telecast. The Mavs' convincing 101-89 win, which ran from 8:46 to 11:19 p.m., averaged 346,285 D-FW viewers on TNT, where the game action was called by little-known Matt Devlin and Hall of Famer Kevin McHale. That drubbed TXA21's presentation, with Mark Followill and Derek "No doubt about it" Harper presiding. It averaged 138,514 viewers for a grand total of 484,799. Saturday night's opening game on TXA21/ESPN had 394,765 viewers overall, with 228,548 for ESPN and 166,217 for TXA21. That's a substantial increase in viewership from Game 1 to 2, but an increasing turnoff of the TXA21 telecast. 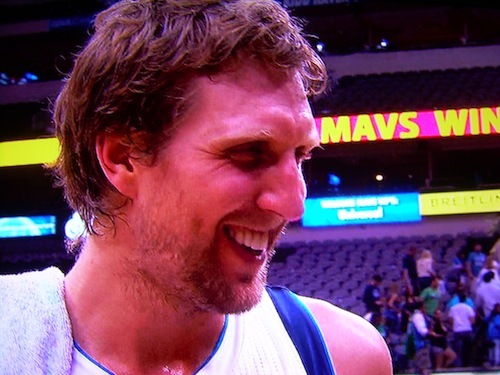 So if you're Mavericks owner Mark Cuban, there's something wrong with this picture. After all, he picks the home team announcers. And late in the season, Cuban dumped longtime analyst Bob Ortegel in favor of Harper for home games and Brad Davis on the road. Those new combos are shooting air balls in times when TXA21's free-of-charge cheerleading telecasts arguably should have a leg up on the cable network alternatives. Elsewhere in prime-time, CBS' NCIS repeat whipped Fox's new episode of Glee in the 7 p.m. hour by a score of 360,136 viewers to 277,028. But Glee dominated among advertiser-craved 18-to-49-year-olds. At 8 p.m., ABC's Dancing with the Stars results show (so long, Petra Nemcova) drew 332,434 total viewers to nip CBS' competing NCIS: Los Angeles rerun (325,508 viewers). But both shows ran second to the aggregate Mavs-Blazers total. Dancing took the silver, behind the Mavs, in the 18-to-49 measurement. The Mavs game also controlled the 9 p.m. hour. But among the Big Four broadcast networks, CBS' second repeat of NCIS: Los Angeles beat ABC's new Body of Proof in total viewers and 18-to-49-year-olds, where Body fell to fourth. In Tuesday's local news derby results, NBC5, WFAA8 and CBS11 tied for first place at 10 p.m. in total viewers, with nice-sized returns of 235,474 apiece. But NBC5 was a dominant No. 1 among 25-to-54-year-olds, the main advertiser target audience for news programming on most stations. Fox4 and the Peacock shared first place at 6 a.m. in total viewers, with Fox4 again making it no contest with 25-to-54-year-olds. CBS11 topped the total viewer Nielsens at 6 p.m., barely beating both Fox4 and NBC5. Fox4 won comfortably in the 25-to-54 demographic. WFAA8 nipped NBC5 at 5 p.m. in total viewers, with the Peacock crowing its way to a first place finish among 25-to-54-year-olds.